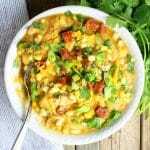 Southwestern Corn Chowder - sweet & hearty flavorful meal in one big bright sunny pot! With Chicken, Potatoes, Corn, Chorizo, Squash, Onion, & Jalapeño. In a large Dutch oven, sauté chopped onion in olive oil over medium-high heat for 3 minutes. Add 2 chopped jalapeños and cook for 2 more minutes, then add garlic, chili powder, cumin, salt & pepper. Cook for another 30 seconds. Add chopped squash, chicken stock, and milk. Bring to a boil, partially cover with a lid, and cook at a simmer for 8 minutes. Add 2 cups of corn and cook for 5 minutes. Raise heat back to medium, then add the chopped potatoes and cook about 10 minutes. Add 2 more cups of fresh uncooked corn, and cook for another 5 minutes. Stir in Monterey Jack cheese, until melted. Fold in the shredded chicken and allow the chowder to cook for 2-3 more minutes to heat the chicken and combine into the chowder. Serve while hot, and top with chorizo, shredded cheddar cheese, chopped jalapeño, cilantro, & green onions. You can substitute the smoky chili pepper spice for smoked paprika or chili powder if preferred. Use a little more almond milk to loosen the chowder when reheating. Frozen sweet corn can be substituted for fresh corn. Fill the blender no more than halfway with soup. Place the lid on the blender and remove the small cap. Cover the hole with a thick folded kitchen towel, holding it in place with your hand. Start the blender on low; slowly lift up the towel to let some of the steam escape. After it starts to purée, turn up the power to reach your desired consistency. Being sure to continue to allow steam to escape.